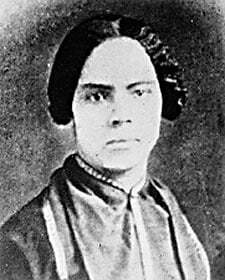 Mary Ann Shadd Cary was a prominent nineteenth-century abolitionist and women’s rights advocate in the United States and Canada. Born into a prominent free black family in Wilmington, Delaware, Cary grew up in a household dedicated to abolition. After the passage of the Fugitive Slave Act in 1850, Cary relocated to Canada, where she started the first black female-run newspaper, the Provincial Freeman . After the abolition of slavery and the end of the Civil War, Cary attended Howard Law School in Washington, D.C., becoming the first African American woman to receive a J.D. In this portrait, Cary exudes restrained refinement, with subdued colors, pressed garments, and meticulously styled hair. Her exceptionally strong gaze, looking just to the left of the camera, projects her resolve and resilience in the fight against slavery and injustice.